Under the water of many lakes and streams is the amazing world of the macroinvertebrate (MAC-row-in-VERT-ih-brate). Macroinvertebrates are often called macros. They are invertebrates (animals without a backbone) that you can see without using a microscope or magnifying glass. Slimy snails are macros, and so are crawly crayfish. There are many different types of macros. Macros that live on or in the ground beneath the water are called benthic macros. Snails, mussels, crayfish, worms and leeches are all benthic macros. Some larval, or young, insects are also benthic macros, though they live above the water when they’re older. Scientists survey benthic macros to measure a water body’s water quality. Scientists know that certain types of macros can tolerate polluted water, while other types cannot. So as pollution increases in a water body, non-tolerant macros die. 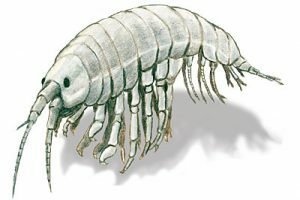 If scientists look along the bottom of a lake and only find tolerant benthic macroinvertebrates, they know a lake is polluted. Because pollution tends to reduce the variety of organisms surviving in one place, healthy waters usually have many different types of macros. A variety of macros in one place is called diversity, and is a sign of good water quality. 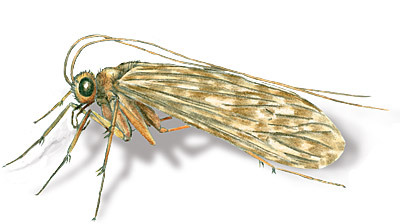 Caddisflies, order Trichoptera, is the largest order of entirely aquatic insects. 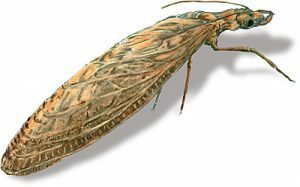 Caddisfly bodies, when turned on their side, usually make a C shape. They have hardened plates on all three of the thorax segments, and branched filamentous gills on the bottom of most abdomen segments. They cannot tolerate water pollution. Damselflies, order Odonata, have an elongate body and most noticeably have three long gills projecting from the abdomen. The head is wider than the thorax and the abdomen. Damselflies are considered facultative, in that they prefer good water quality but are somewhat tolerant of impaired water quality. Dragonflies, order Odonata, are similar to damselflies, but the body of the nymph tends to be long and stout or oval and flattened. Dragonflies do not have gills on the abdomen. Three short, stiff, pointed structures occur at the end of the abdomen. 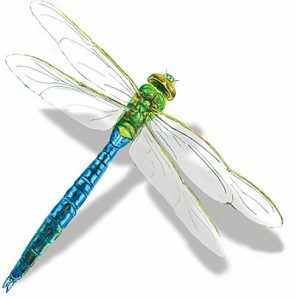 Like damselflies, dragonflies are predators and as adults move fast to capture prey. Also like damselflies, they tolerate some level of impaired water quality. Dobsonflies, order Megaloptera, are a small group whose larvae have flattened, elongated bodies. They have prominent chewing mouth parts and three pairs of segmented legs. At the end of the abdomen there is a pair of pro-legs (unsegmented appendages) with two claws on each. The adults are distinguished by a pair of long wings that have many veins. Dobsonflies are considered beneficial to the water body which they inhabit as they increase diversity. They thrive in clean to moderately clean water. 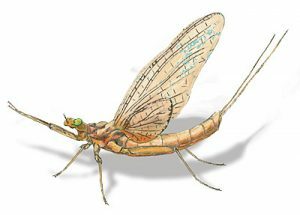 Mayflies, order Ephemeroptera, are known for their short adult lifespan, often only a few hours. 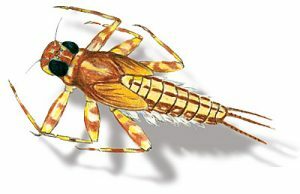 The nymph have elongated bodies that are slightly flattened. The wingpads and three pairs of legs are on the thorax. Each leg has a claw at the end for grasping material to move around. Three long tails usually occur at the end of the body. 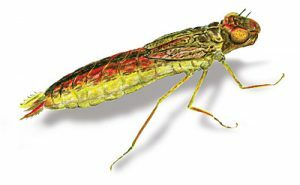 Mayflies do not tolerate pollution well. Stoneflies, order Plecoptera, are distinguished by two long thin tails projecting from the rear of the abdomen. The body is somewhat flattened, and there are two claws that extend from the three pairs of segmented legs. Stoneflies are considered crawlers and crawl around looking for food. They are not tolerant of water pollution. Crayfish, order Decapoda, are often called crawdads. They are usually brownish green in color but can change color to reflect the surface they are on. They have five pairs of walking legs and one pair of long antennae. The first two or three pairs of legs have a hinged claw at the end. A broad flipper extends from the lower abdomen. Crayfish live in shallow water or burrow in the mud of a wetland. They are an important part of the food chain of most wetlands. Crayfish are tolerant of temperature, pH and alkalinity, but are sensitive to toxic substances such as metals. In fact, the district has used crayfish to track bioaccumulation of pesticides in restoration projects. 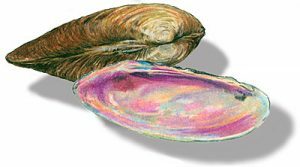 Mussels, order Unionoida, are bivalves, meaning they have two shells that are opposite each other and are strongly connected by a hinge. The shells can vary in color from light green to blackish. Mussels are filter feeders and can contribute to purification of the water in which they live. Mussels tolerate low levels of dissolved oxygen. Gill-breathing snails, order Stylommatophoria, have a single shell that is usually coiled and elongate. They have a large muscular foot for stability. Their gill is located on the body inside the shell. Like crayfish, snails occupy an important part of the food chain as they consume algae off plants. Gilled snails are somewhat sensitive to water pollution, especially to decreased dissolved oxygen. 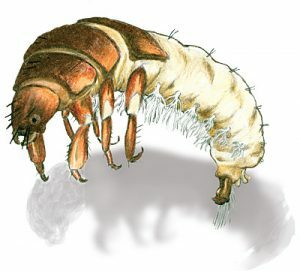 Scuds, order Amphipoda, are common shrimp-like animals often found feeding on detritus (decaying plant material) at the base of aquatic plants such as cattails. They move quickly through the water and can be hard to catch. They tend to be very abundant in small habitats without fish. 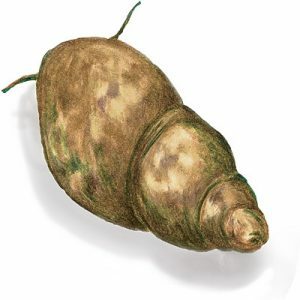 Scuds are generally tolerant of impaired water quality.